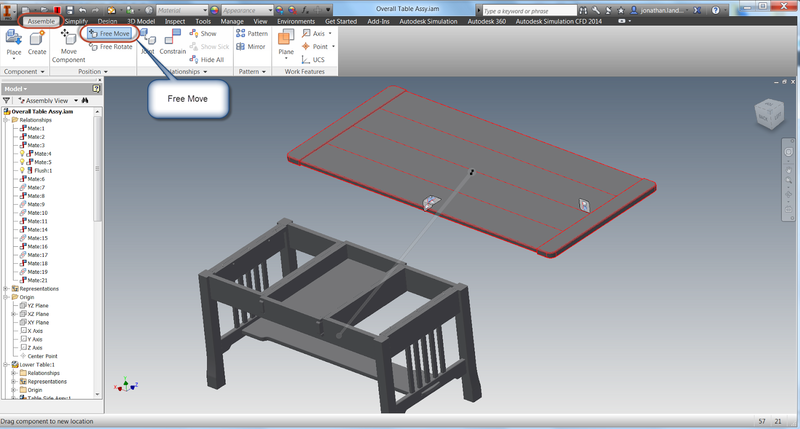 Sitting in my hotel room on a business trip to Dallas, Texas, I found myself taking a look at a new feature in Autodesk Inventor 2014, and thought I would go ahead and create a short post on it. This new feature is "Show Relationship" in an assembly. 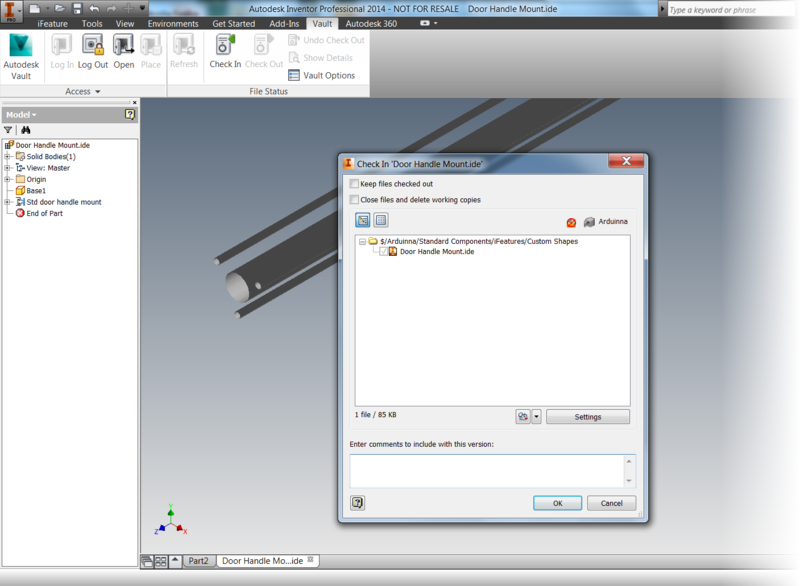 Activating this feature shows the relationships between constraints in the modeling window, in a graphical format. For this example, I'll use the Craftsman style coffee table I've used dozens of time before. By using a graphical representation, the constraint can be easier to visualize, modify, and delete. The first step to using the relationship is to show them. 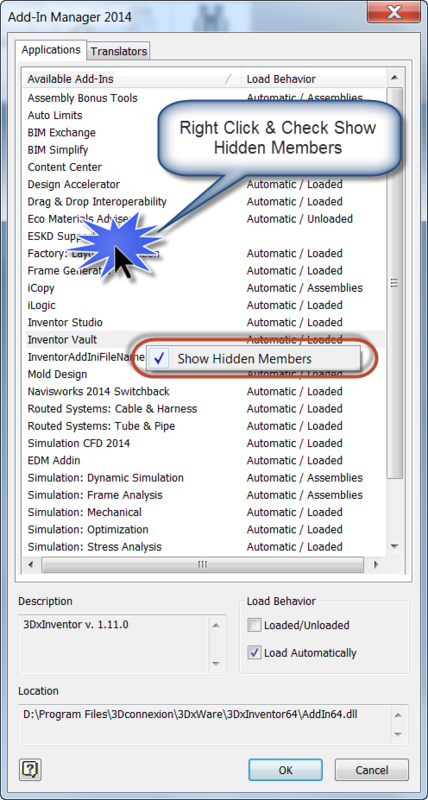 This is located on the Assemble Tab by clicking the Show icon. Once the icon is selected, I can choose the components I want to show the relationships for. In this case, I'm just going to look at the table top. 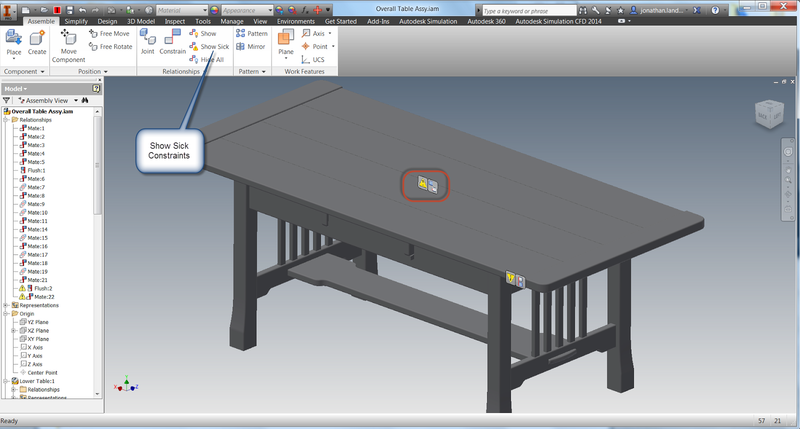 Glyphs will appear where the constraints between the table top and the lower table it's connected to. Right clicking on the constraint glyphs provides the operations that can be performed on this constraint, such as, Edit, Delete, and Suppress, among more. If the component is moved using the Free Move command, "bands" appear that connect the constraint to its mating components while the command is active. After this I can right click and choose "OK" to complete the move. 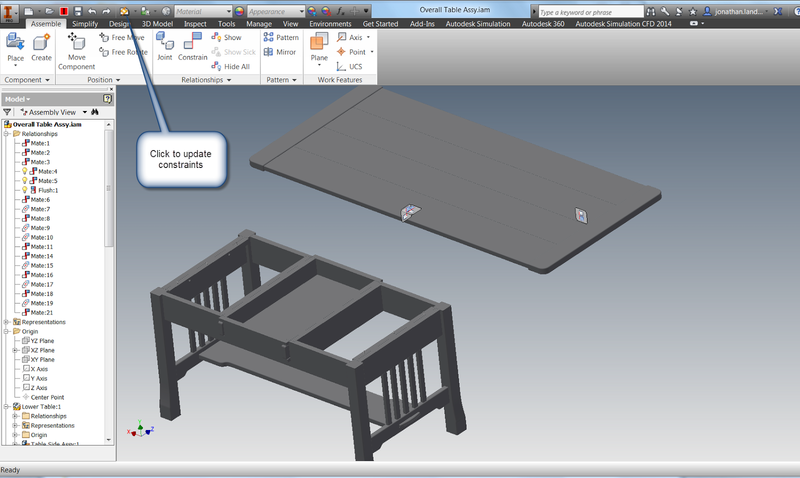 Updating the assembly will update the constraints and return the component to its original position. But before I say "take this tool for a spin", there is on other place this tool can help out. If there are "sick" constraints, such as conflicting constraints, can be graphically diagnosed using the Show Sick Relationships tool. Showing Sick Constraint Relationship for diagnostic purposes. 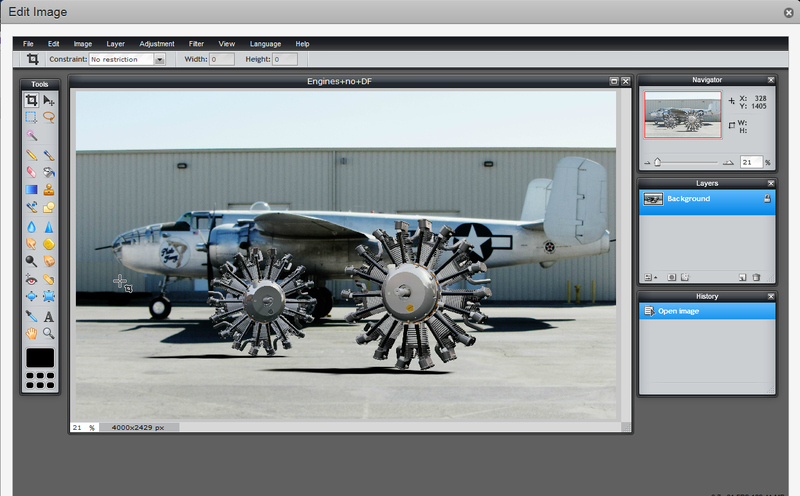 With this ability, the Show tool can be used for editing, and for diagnostics! 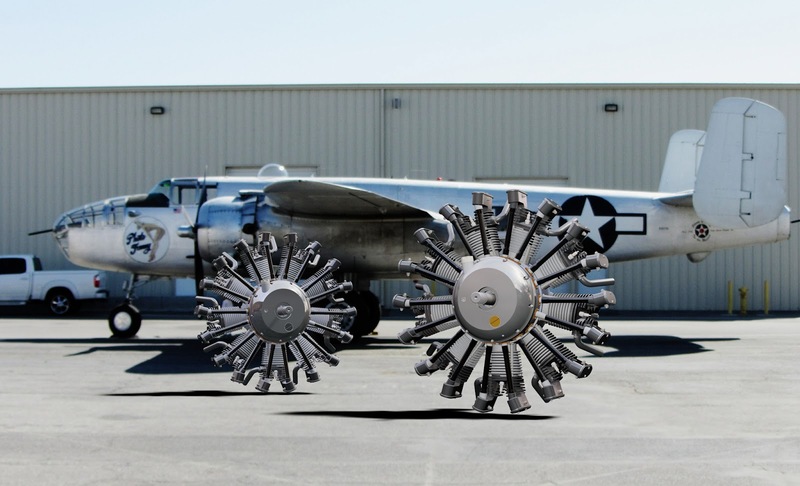 So on that note, take this tool for a spin! And in addition, here's a video on the subject! 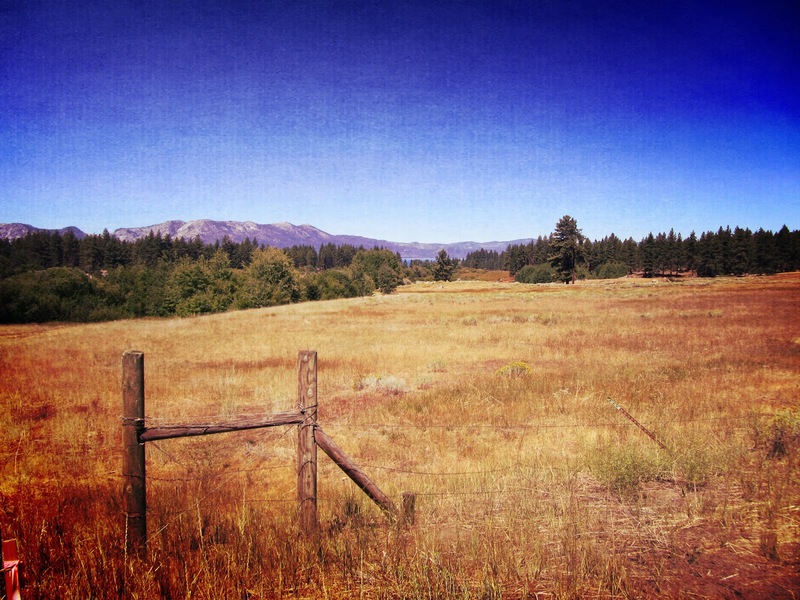 This weekend's blog post, by nature, has to be a short one, and without video. This weekend I'm between trips out of state, so I've been busily trying to get caught up, and prepare to leave town again. Much off this consists of unpacking into the washing machine and directly packing it again! I'm going to start with a Craftsman Style coffee table that I've had in my archives for several years now. This table uses No 8 x 1.0 inch wood screw that I placed from content center. But now, these files are old, created from a 2013 library, and not a 2014 library. So what's one way to make sure that those files are made current. 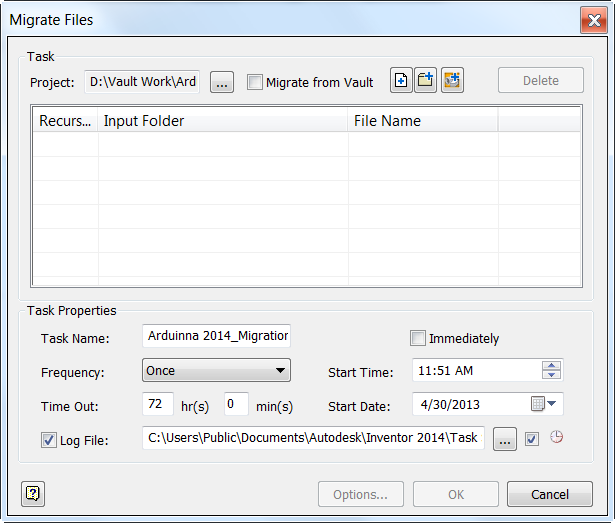 1) If Autodesk Vault is being used, make sure to check out all the files from Vault. 2) One the Manage Tab, choose the "Refresh Standard Content" Icon. 3) Inventor will display which content is in need of refreshing. 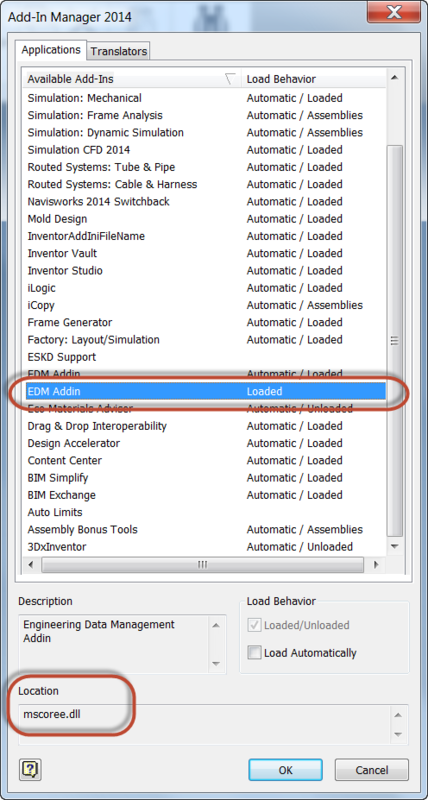 If several different components are being used from Content Center, then multiple components can be selected (or not) in this dialog box. 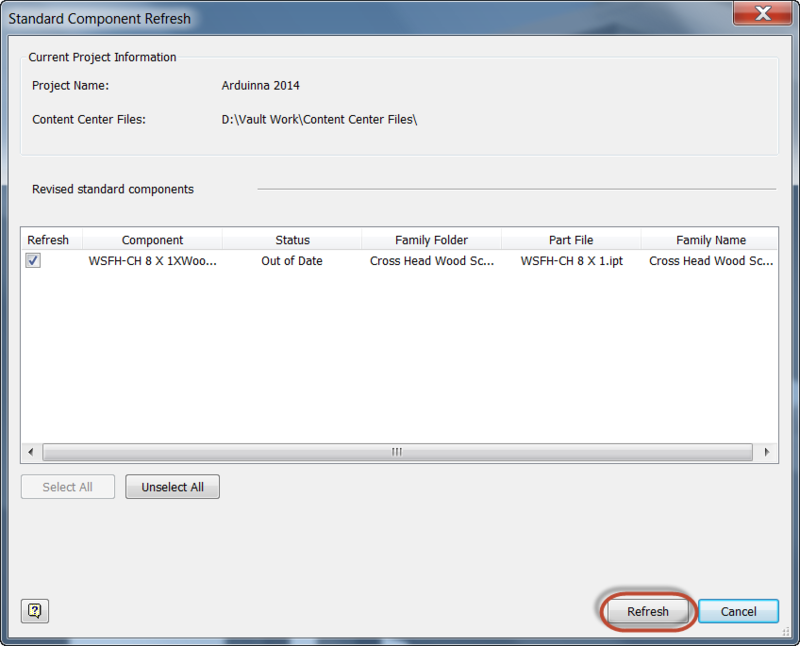 4) Click the Refresh icon to update the content from the Content Center Libraries. 5) Now all that's left to do is save the assembly, and, if Vault is being used, check the file in. 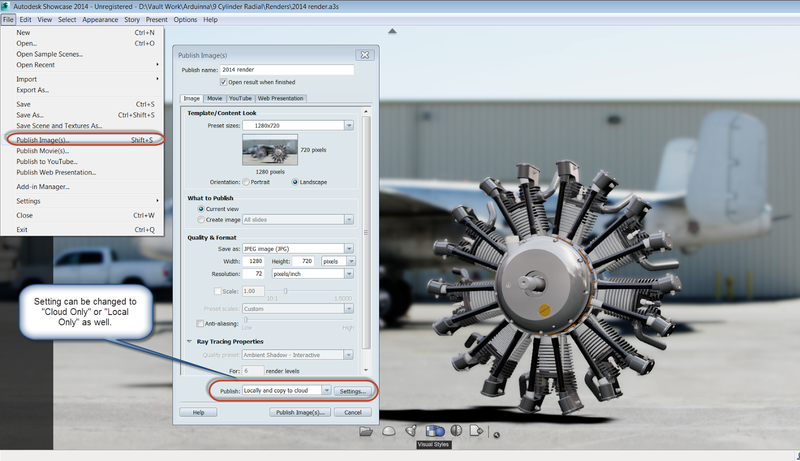 For some more info on updating the libraries, including migrating custom content libaries from an earlier release of Autodesk Inventor, check out the link on Autodesk Support here! 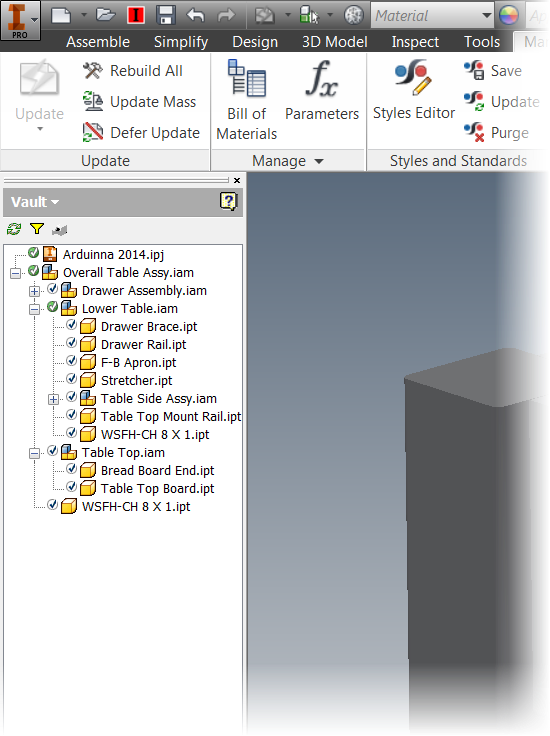 Placing an iFeature from Autodesk Vault 2014 - New for 2014! 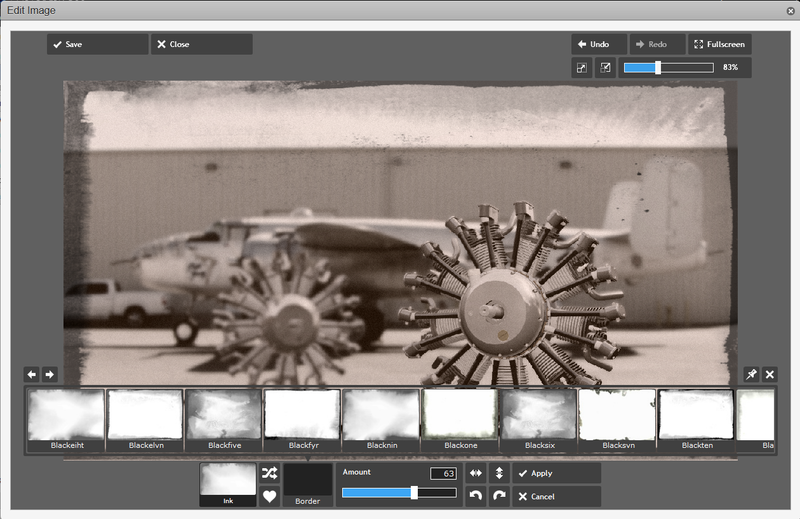 Early this week, I had a chance to play with an intriguing new feature of Autodesk Vault 2014. 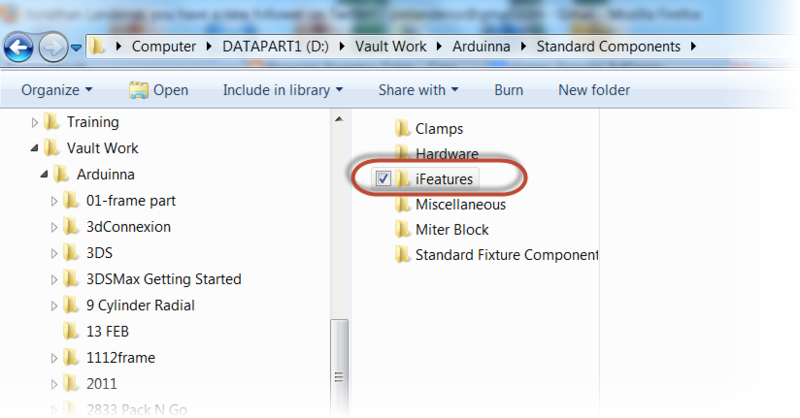 It's the ability to add iFeatures to, and place iFeatures using Vault. I'm going to definitely use this tool in my personal projects. I've created plenty of features in my day, and many times, I recreate them because I'm careless and lose them, forget to migrate them, etc. I can get creative when losing iFeatures. Trust me! No matter how many times I tell myself I'll be more careful, I've sent many an iFeature to the "Land of Lost Files"! Vaulting iFeatures will definitely reduce lost iFeatures in the future. But, is it set up to work with Vault? I don't claim to have all the tricks figure out. I'm still trying some things out, but here's what I've discovered so far. 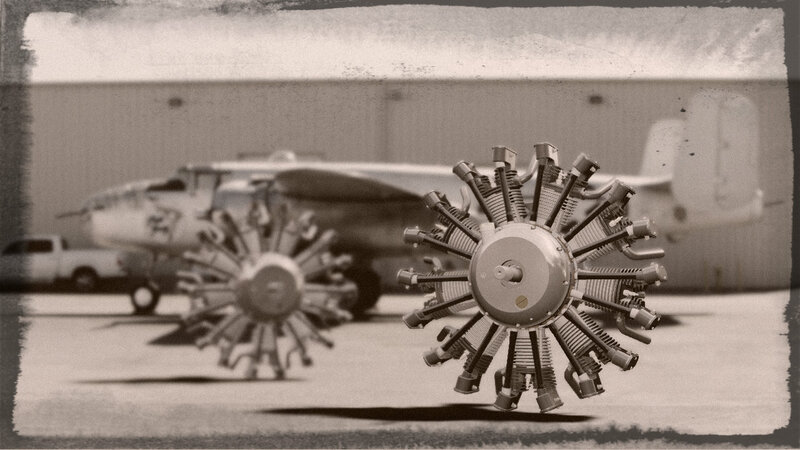 Take my ideas, modify them, tweak them, and use them for inspiration. The first thing I did, was choose a folder in my Vault Workspace to store my iFeatures. I also copied my default iFeatures here, so I can use them if I want. Why? This will prevent this error, when trying to check in iFeatures from the default Inventor location! 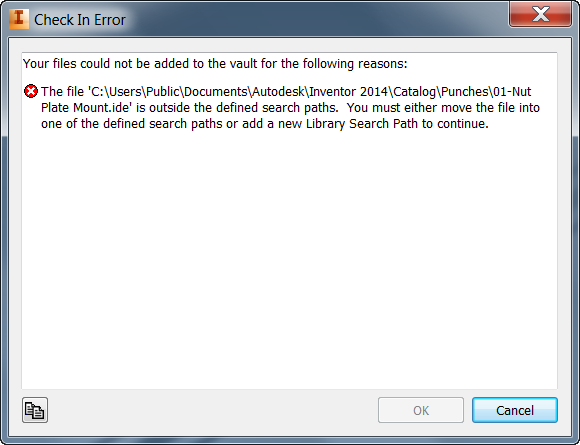 This error is caused because the default iFeature location isn't located in the Vault Workgroup path. This is an error. Years of experience have taught me that errors are bad. 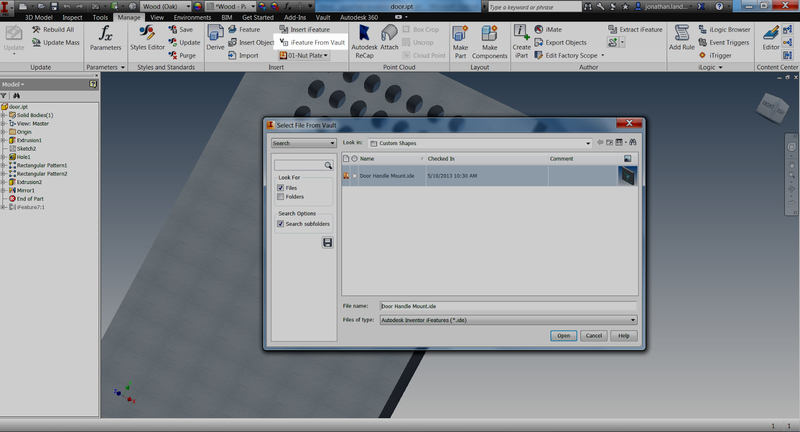 I'm also going to change Inventor's default iFeature location to match the workspace. This will make sure that I'm always using the same iFeatures I've Vaulted, even if I don't place the iFeature directly from Vault. 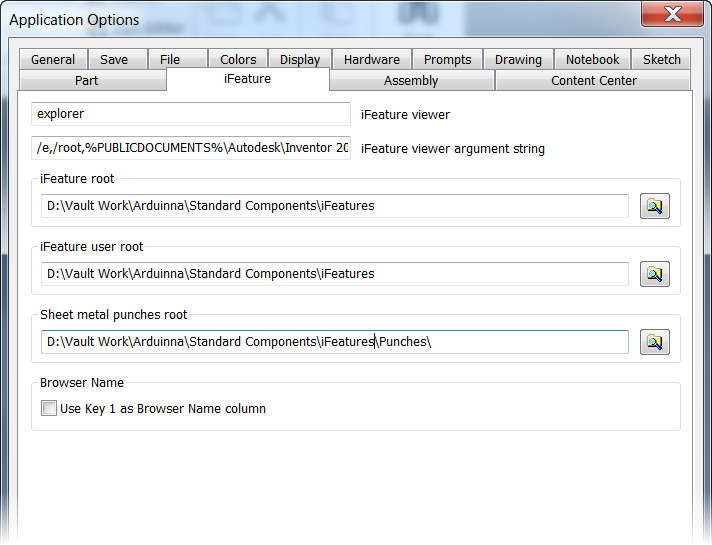 First, I change the default iFeature location in Tools>Application Options>iFeature Tab. Note that sheet metal punches are a special class of iFeature, so I'm going to change that location too. Now, an iFeature can be checked in and out of Vault, and enjoy all the benefits of being stored in Vault! Once it's checked into Vault, now it can be placed from Vault onto a part that needs it. And after that, it's just like an iFeature has been place for years! And here's the video version of the process! One thing I have noticed, is that this tool doesn't work with sheet metal punches. So I've decided that I'll have punches Vaulted but keep them in my local workspace, using the settings I created above. Maybe we'll see that one come in the next release! 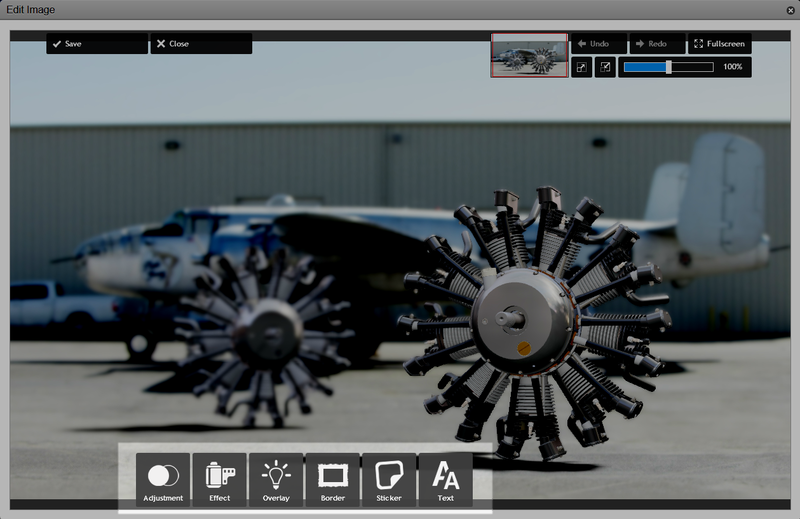 Autodesk Showcase has a lot of tricks up it's sleeve when importing models. But that leaves the challenge of knowing when to use which trick. 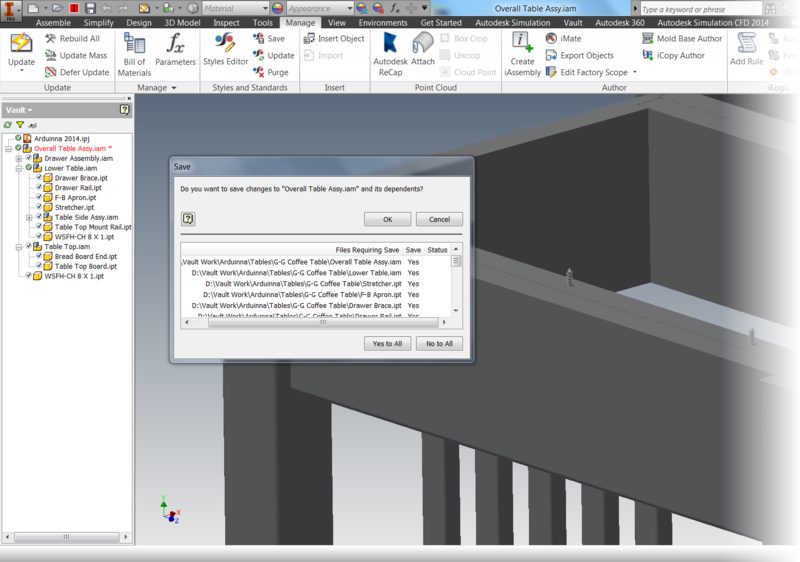 One challenge, I know I've always faced is importing Autodesk Inventor Constraints as Behaviors in Showcase. I don't do it often, so I find that I figure out how to use them for a scene, but then I don't use them for a while. The next time I need to use them, I've managed to forget everything I learned, so I have to relearn it again! But as many a teacher has reminded me over the years, "It's not about knowing information, it's about knowing where to find information". So here is another guest video by Marion Landry on how to use import settings in Showcase to make sure you get the results you want! It gave me some more ideas on import tricks, and I'm sure others will find it helpful too! 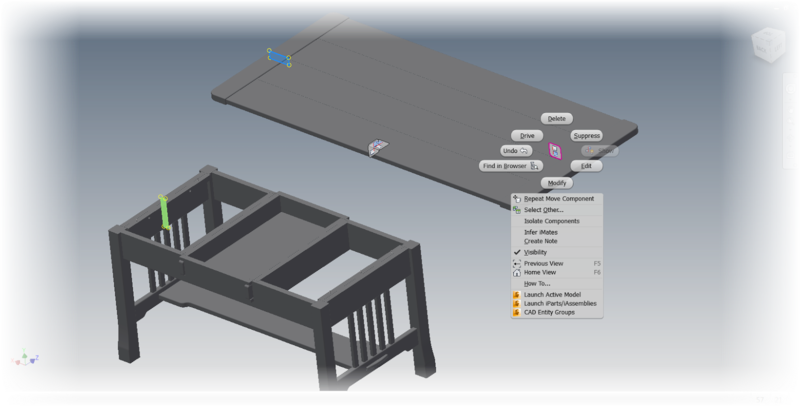 In a blog post a "few moons ago", I discussed how to get model sketches and show them on a drawing in my post: "Using Model Sketches on a Drawing in Autodesk Inventor". In that post, there was a comment that stated once the sketches were made visible, the option to "Get Model Sketches" was grayed out. Which is true. 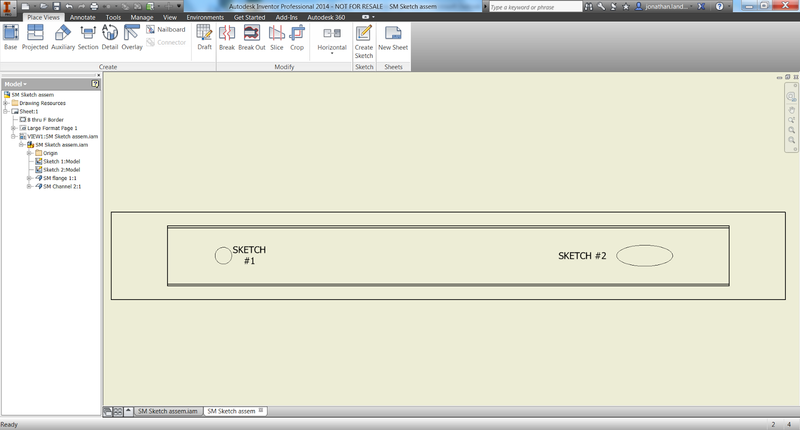 So how can the visibility of sketches if they're added to the model after the "Get Model Sketches" option is used. 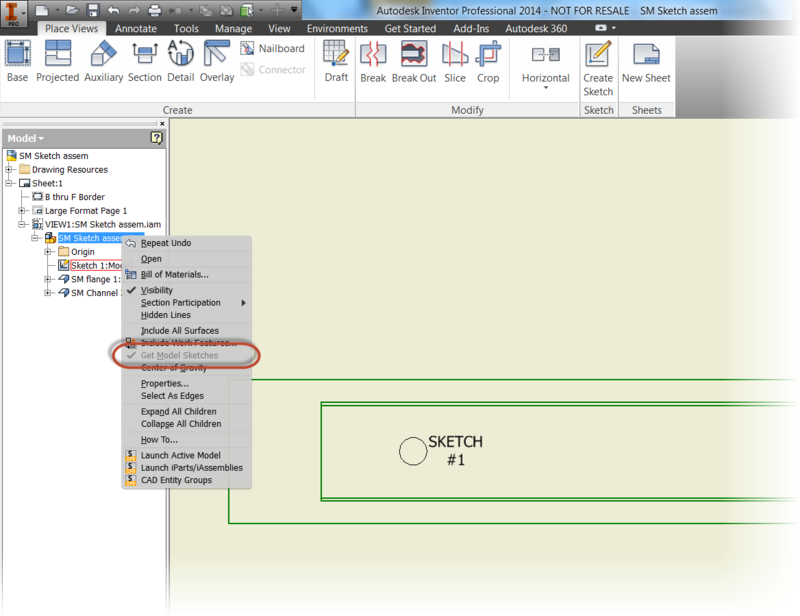 Here, I've added a second, distinct sketch in Autodesk Inventor 2014. 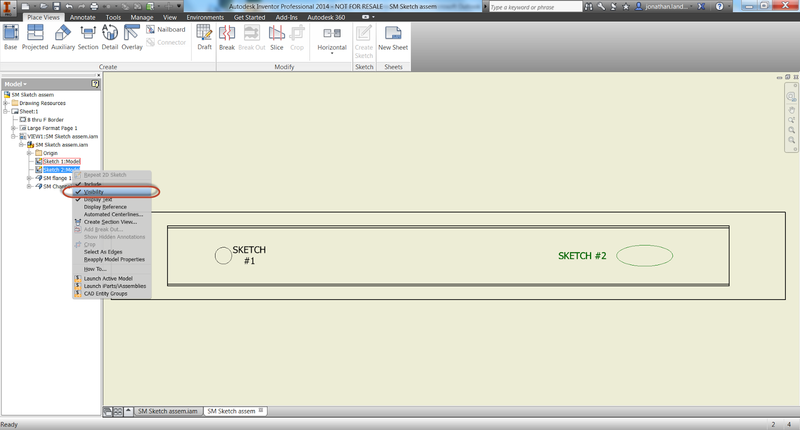 When I switch to the drawing, the sketch will automatically appear on the drawing, with no further interaction. But what if I don't want to show both sketches. 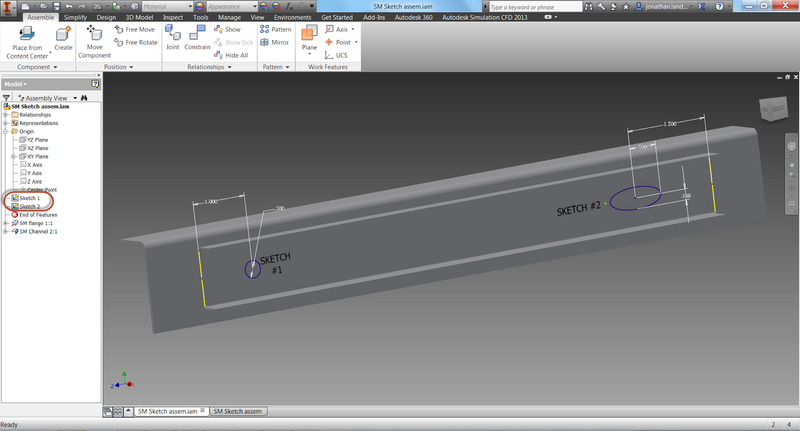 Perhaps one sketch represents a spot weld, and the other is just there for construction or a model only reference? All that I have to do is right click on the sketch in the browser, and uncheck the "Visibility" option. The sketch will disappear and will no longer be shown. 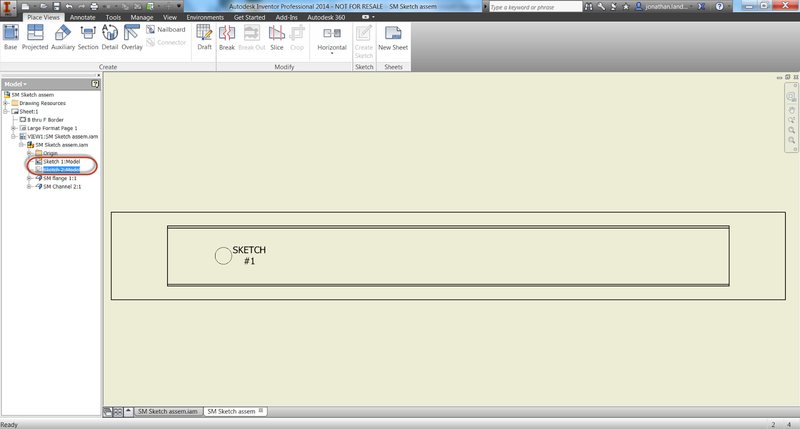 Showing the sketch will make the sketch visible again. Being able to control the sketches individually adds more flexibility that an "all or nothing" approach. So take a look and see how you can use it! “Are you suggesting that coconuts migrate?" 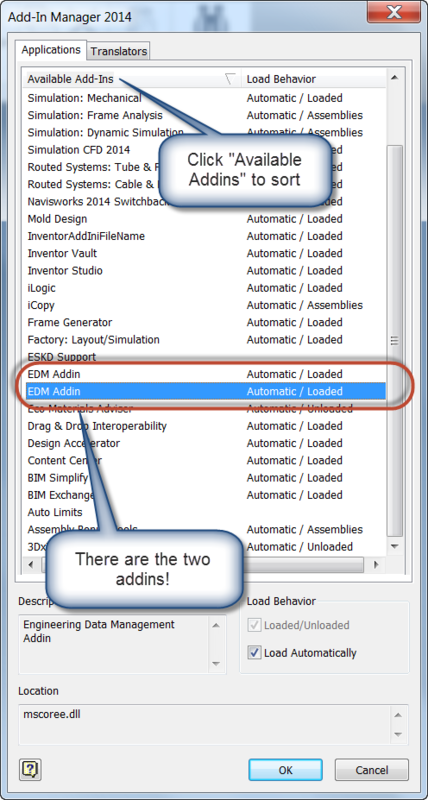 In a previous post, I talked about migrating Styles from a previous release of Autodesk Inventor into Autodesk Inventor 2014. 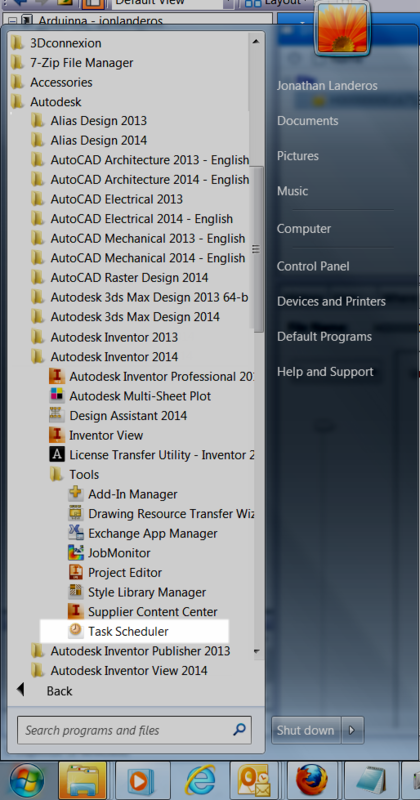 The simplest way, of course, is just to open each file in Inventor and save it. This will migrate the files. And it does have it's advantages. Opening the file would allow for an "inspection". 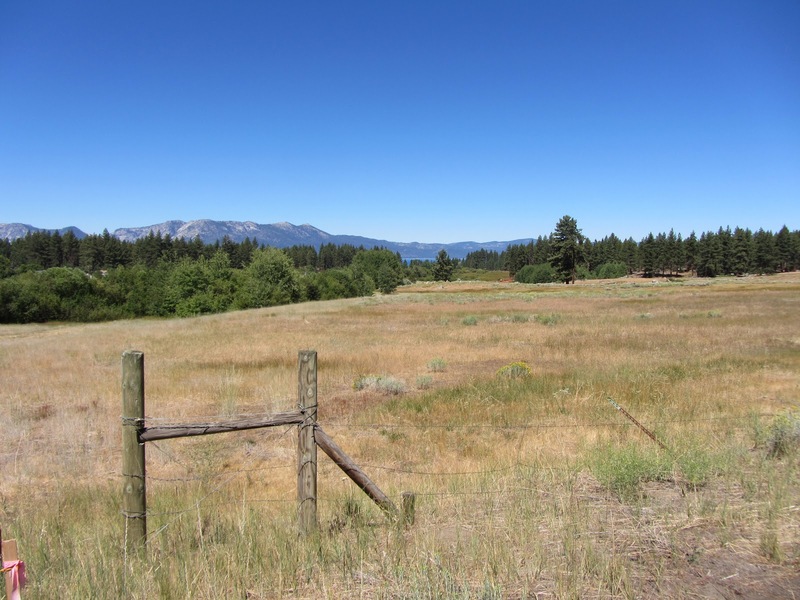 Old styles could be inspected and purged, new styles can be added, and general clean up could be performed. 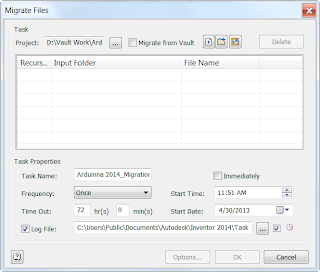 But another way to quickly migrate files would be to use Inventor's Task Scheduler. This tool allows for the templates (and any other file for that matter), to be migrated in batch, hands off. Note! Before migrating any templates, make sure you've backed everything up! I've never had a problems with migration, but you only have to be wrong once! 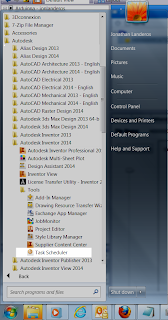 To access Task Scheduler, go to Windows Start>All Programs>Autodesk Inventor 2014>Tools. Task Scheduler will be in there. 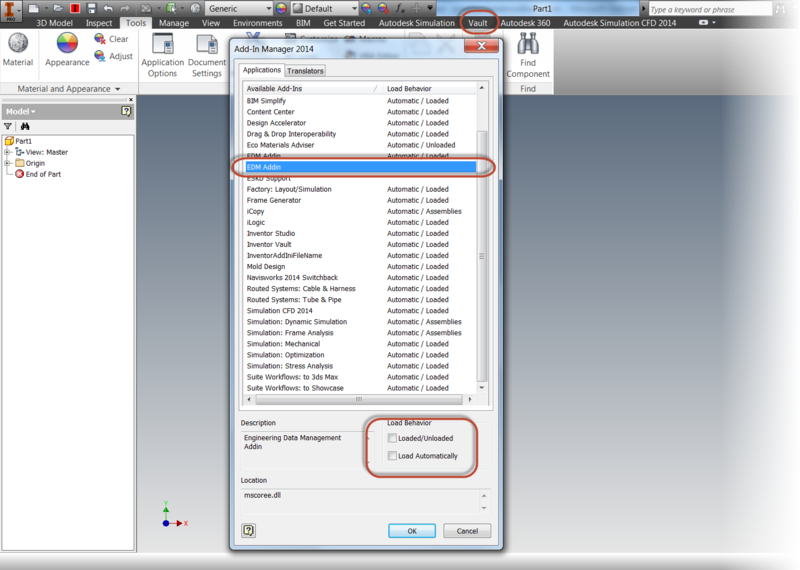 Selecting the icon will open Task Scheduler for use. 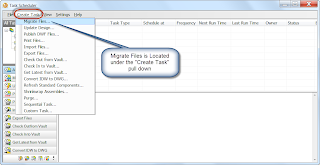 Choosing Create Task>Migrate Files will bring up the dialog box to set up migration tasks. 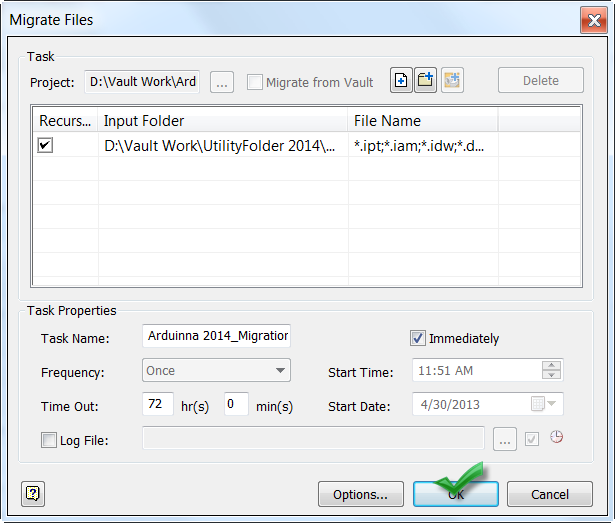 With the Migrate Files dialog open, now the settings for migration can be configured. Under Task properties, it's also possible to give the task a name (I just use default), and schedule the task for a given time. 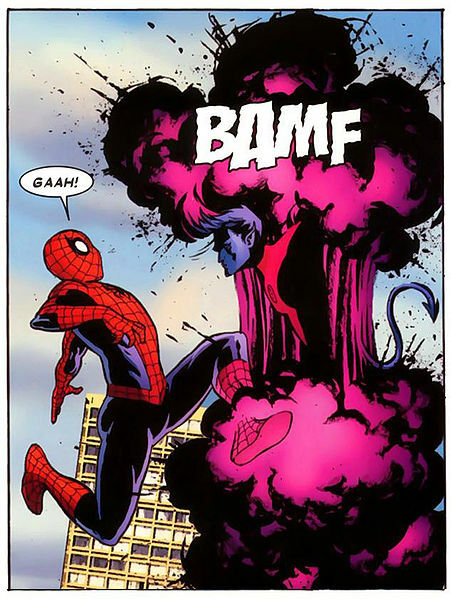 Since my templates aren't particularly large, I'm going to run them immediately. 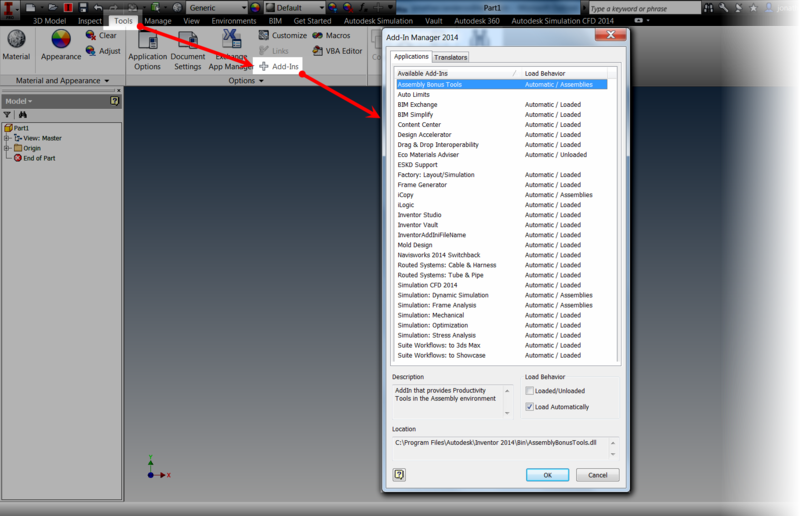 In the dialog below, I've added the folder to migrate, and completed my settings. I also like to click on options, and have the Task Scheduler Skip Files with Unresolved References, Purge Old Versions, and Compact Model History. If these were parts with features, I'd also compact the model history, but these are mostly empty templates. 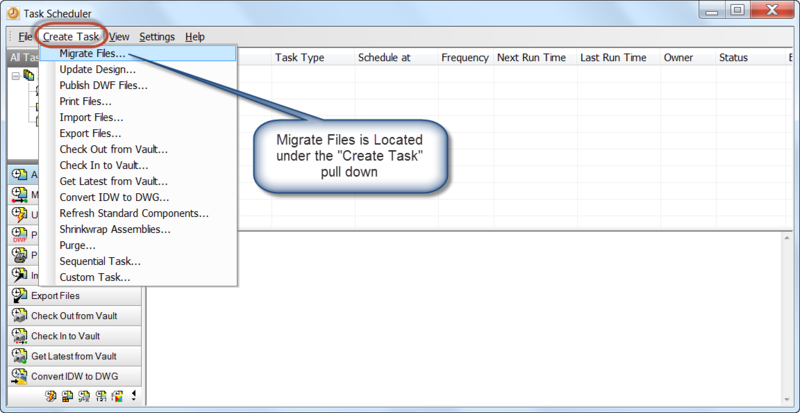 Once the settings are ready, I can close the Migration Options, click OK, and start the migration. The migration will begin running. For templates, this typically takes a few minutes, but it does depend on how many files are being migrated, so that has to be taken into consideration before starting. 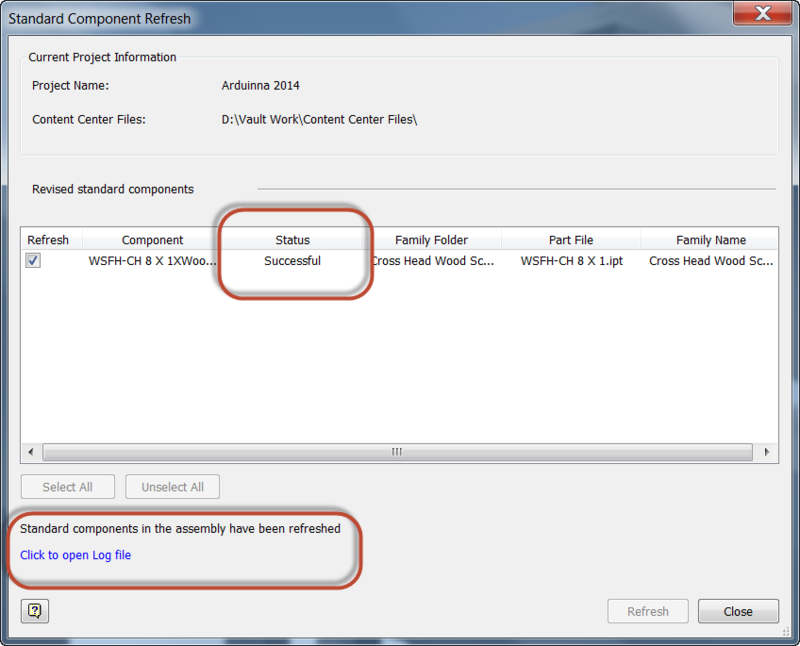 Once the notification is completed, right clicking on the task will allow for a report to be generated that will show which files were successful, and which files failed and why. But those are the steps to migrate files. Here I've used them in templates, but they're not limited to just template files. This is valid for any Inventor files, so remember that it's available for use! If you prefer the video form, just take a look below!